Data-sharing can be a powerful tool to connect communities, improve health, and promote equity. Not sure how to make it happen? 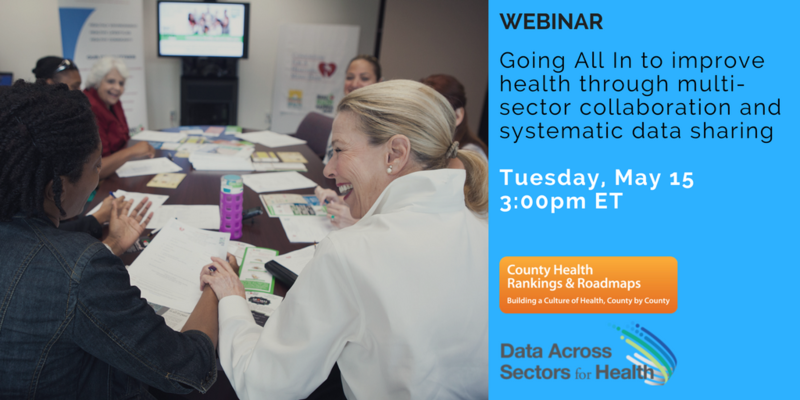 Join County Health Rankings & Roadmaps and DASH for a webinar to hear more about promising practices in data-sharing and multi-sector collaboration. You’ll also hear from Trenton Health Team and Legal Assistance Foundation Chicago about their experiences. Click the link at the right to register for “Going All In to improve health through multi-sector collaboration and systematic data sharing,” scheduled for Tuesday, May 15, 2018 from 2-3pm CST.